This page includes Book Review columns from the 2002 issues of Across the Fence Post. _By Brian J. Liedtke, WFSC VP South Central Region; Member Waukesha County Phil. Soc. The layout is fresh, uncluttered and generally readable with usually five to 10 listings per page. The typeface is surprisingly large. Illustrations are well done, with only a few blurred, grainy images still needing replacement. Besides the usual color, perforation and denomination, most listings include quantities released, designer, format, printing method, printing press or company, and source of the artwork. Catalog values are given in fine-to-very-fine condition to 1939 and in very fine condition to date. In our hobby dominated by Scott catalog numbers, the Minkus numbers on each page seem odd and unfamiliar. The publisher offers a mail-in card to receive a Minkus cross-reference. It is possible to ignore the Minkus number, identify by image instead, and concentrate on the listing details and the many helpful collateral features. Numbering the 1847s as No. 1 and No. 2 obviously causes no problem. But references to the 34 Liberty of 1954 as Minkus 573 (not Scott 1035) take some practice. The non-conventional number is less noticeable in the back-of-the-book sections where collectors have less to page through. Regular issues and commemorative listings are split and listed in issue order. Listing the classic issues in chronological order is fine but this complicates the Americana, Great Americans, and Transportation definitive sets. The face-different designs were released over a number of years (not the whole set on one date). The Americana set is not listed in denomination order from 1-cent to $5, rather in issue-date order starting with the 9-cent Capitol Dome. The Great Americans debuted in 1980 with the release of the 19-cent Sequoyah, not the I-cent Dix (issued September 23, 1983). The five chronological listings after Sequoyah are the 1981 rate-change issues: (B) nondenominated Eagle, 18-cent "amber waves of grain," and 18-cent "purple mountain majesties." Three pages later we get the second Great Americans item (18-cent George Mason issued May 7, 1981). Christmas stamps are dispersed among the regular issues, further mixing up the flow of definitive sets. Oddly, Love stamps are not to be found until the commemorative section. The holiday stamps of Kwanzaa, Hanukkah, Eid, etc., are also listed as commemoratives, although the U.S. Postal Service promises to re-release the same design with each future rate increase (a characteristic seen more often with definitives like the F-rate Flower stamps and the variously colored Rose self-adhesives). Most delightful are the ubiquitous "Decoding the Catalog" studies and other charts and diagrams of enlarged stamp detail. The special treatment starts with 1847 and 1851 types, continuing with Banknote types and including an eye-catching write-up on the 15-cent Oliver Holmes redrawn necktie variety. Seeming a breakthrough in U.S. stamp collecting are the charts identifying the specialized varieties of the Washington-Franklin, Great Americans and Transportation issues. Have a W-F 2-center? Start by measuring the perforations. Each possible watermark, printing method and frame style is charted to give the exact catalog number. The Great Americans and Transportation series charts are even more fun with varieties of perforations, gum, and tagging. The non-conventional Minkus catalog numbers, however, become more confusing with each layer of specialization. 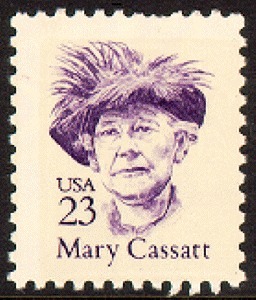 An example is the fourth 23-cent Mary Cassatt variety, with a Minkus number of "915zlpzs." This is a bizarre abbreviation for shiny gum, phosphored paper. I searched in vain for a key to the sub letters. I think "n" is for pane, "z" is for overall tagging, and "v" is for variety. You'll have to figure out the other sub letters used in the catalog. Inconsistencies plague the treatment of modern uncut press sheets. The first full printing sheets sold were the 1994 Legends of the West, for which the catalog has a footnote, "available to collectors in full six-pane printing sheets." Some press sheets are assigned a catalog value ($125 for the Legends sheet). Same releases are ignored entirely. Take the Celebrate the Century press sheets as an example. The 1970s sheet is not mentioned. The 1980s version is listed as a sheet of four but is not priced. The 1990s sheet is listed and priced at $10, which must be a typographical error, because the 1990s pane of 15 is also priced at $10. Unfortunately, inconsistencies continue. The catalog uses a footnote to acknowledge the existence of press sheets of the 1999 Aquarium Fish issue. The next commemorative listing is the 1999 Extreme Sports, for which the Postal Service also made available uncut press sheets. It is ignored in the catalog, as are the press sheets sold for the 1999 James Cagney and 1999 All Aboard! issues on the next page. This large 744-page volume is split roughly in half. The first 400 pages contain the regular and commemorative listings. The second half is devoted to an extensive array of back-of-the book issues. Each section starts with a helpful introduction noting the origin, postal purpose and printing detail. Noteworthy is the envelope and wrappers introduction which features detailed illustrations of the watermarks that help make the early envelopes such a puzzle. Making a debut in this fifth edition are booklets, test stamps, and a basis listing of the "makeshift" MDI vending booklets of the mid-1990s. The fascinating splash of test stamp/ dummy stamp sheets, coils, and booklets is the most complete cataloging available anywhere. 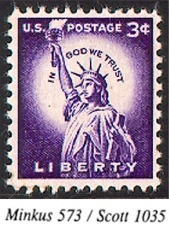 Many of the illustrated dummy stamp designs are quite unfamiliar to U.S. collectors. The catalog rounds out with a listing of eight U.S. territories and protectorates: Canal Zone, Cuba, Danish West Indies, Guam, Hawaii, Philippines, Puerto Rico, and Ryukyu Islands. The AMG (Allied Military Government) section is new The last few pages remind the user of Krause's numismatic publishing origins: Stamps Used as Money. This fresh volume is an extremely helpful collecting tool. For those collectors who haven't purchased a U.S. catalog in a few years, I highly recommend giving this one a try. Krause-Minkus has produced an intriguing 6-inch-by-9-inch abbreviated catalog for philatelists to keep track of their collections. The size is ideal for carrying to club meetings or stamp shows. The listings include all of the stamps expected to be listed in a condensed catalog and using, of course, the Krause-Minkus numbering system. 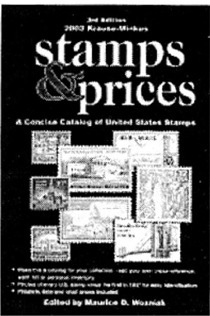 Black-and-white illustrations are included to help identify the stamps. The introduction states that the catalog allows space to write cross-reference catalog information (1 assume Scott catalog numbers would be a possibility) and five columns of boxes to fill in for tracking collection inventory. Examples to track might include a used single, mint single, plate block, etc. Current prices are also given for each stamp listed. Looking through the catalog, I see that the stamp listings are strictly the major catalog numbers. Varieties are mentioned in an occasional footnote. Therefore, my review will focus on the usefulness of the catalog for the general U.S. collector. I had some real problems trying to figure out the listings for the Banknote issues of 1870-79. No mention is made of the printers or the paper types for the issues. Some mention should be made that the 1873 issues are on wove paper and the 1879 issues are on soft porous paper. 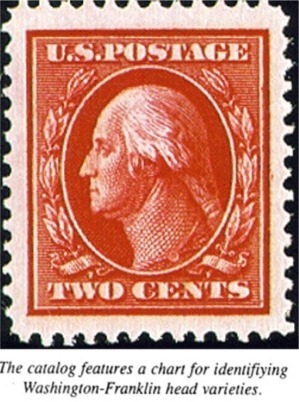 The Washington-Franklin issues of 1908-21 are a perplexing group of stamps containing combinations of flat plate, rotary, and offset press printings and perforation varieties all found on sheet and coil issues. Throw in watermark varieties and you've got your hands full. 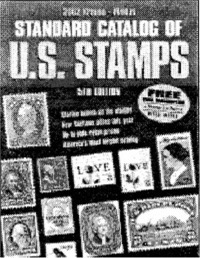 Unfortunately, the catalog only mentions the year that the stamps were issued and whether the stamp is a coil (but not if it is vertical or horizontal). I could not find any imperforate listings, but they may be part of the uninformative listings. Modern detinitives are also complex. In places, the catalog contains details that are not of any use to the general collector, while in other places, it does not include enough detail. For example, the 2-cent Mary Lyon issue is listed as "...tagged (large block)." The untagged version of this stamp is just as common. I'm sure that the general collector does not care how the stamp is tagged. Meanwhile, the 33-cent Fruit Berries definitives were issued as convertible books, vending books, double-sided books and coils. The catalog does not give the needed die-cut gauge measurements in the listings to differentiate between stamps from the convertible book (gauge 11.5 x 11.75) and those from the vending booklet (gauge 9.5 x 10). Both listings are given as "1999. Fruit Berries Issue." The commemorative listings are a bit cleaner. I note that some of the illustrations are several pages ahead or behind their listings. This may cause a problem if a collector is working through a dealer stock with Scott catalog numbers. I also found that issues such as Celebrate the Century have only a single line in the catalog. How does the collector know what used stamps are needed if they cannot be properly notated? I do not think the answer is to have the collector manually write in the individual listings. Overall, the concept of the catalog is useful. Many of the listings and illustrations, however, need some additional editorial work to make this catalog user-friendly for the general collector.